Expressive Arts tickets!! Available here and free!! Action items are recorded in purple text. 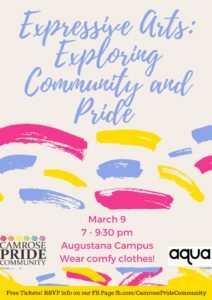 AQUA is planning other events that will take place on campus during Pride Week. These will be shared with the group on Facebook and on the website. This will be an all ages event. Anyone is welcome to enter the competition. More information will be coming soon. It will be important for us to have information about Camrose Pride Community and upcoming events at all Pride Week events. 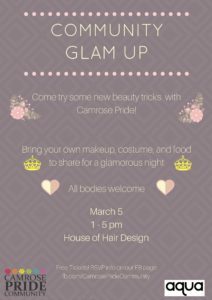 If anyone from Camrose Pride Community wants to attend and help supervise, contact Carol. 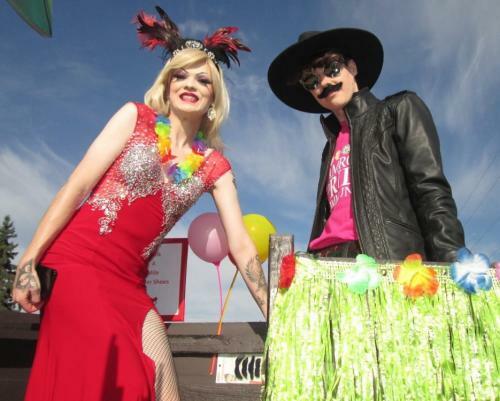 National Film Day –> April 19 5:30 – 7:30 p.m. at the Bailey Theatre –>Camrose Pride was asked to choose a film that will be shown this day and invited to introduce it. Survey–> If anyone is willing to offer information by completing the Edmonton Men’s Health Collective Sexually Transmitted and Bloodborne Infections Strategy Survey, contact Carol very soon. This is time sensitive. The group brainstormed and discussed various possible events for the upcoming year and these were added to flipcharts for each month. There is an overlap of Education and Social events as many social events in the community are an opportunity to provide education. All suggestions are open to revision. Time has been built into the calendar for planning and preparation. These plans did not include our regular meetings each month (Regular meeting on the first Monday of the month, Family and Friends Support Group on the second Monday of the month and espressOUT on the third Monday of the month) which will continue. February 7 Human Library: Ehren is giving a talk at the Augustana Human Library at 7:00 p.m.
February 13 Family and Friends Event at Camrose United Church 7:00 – 9:00 p.m.
February 13 Youth Film and Game night at Camrose Public Library 6:00-8:00 p.m.